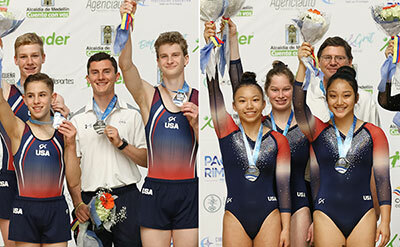 MEDELLIN, Colombia, April 28, 2018 – The U.S. men’s and women’s trampoline teams each claimed the silver medal today at the 2018 Pacific Rim Championships in Medellin, Colombia. Trampoline competition wraps up later today with junior and senior individual competition. In the women’s competition, Sydney Senter of Aiea, Hawaii/Hawaii Trampoline and Tumbling, got the U.S. underway with a 52.150, executing a tucked Triffus and a layout full-full to close. Miah Bruns of St. John, Ind./Midwest Training and Ice Center, was next to go, earning a 51.870 score for her routine that concluded with a piked half-in, half-out. Jessica Stevens of Ellicott City, Md./Fairland Gymnastics, was last to go and posted a 51.935 giving the U.S a team total of 155.955 and the silver medal. Stevens’ routine included both piked and tucked triple front half-outs and closed with a layout full-full. Japan took the gold at 159.760 and Mexico was third (153.175). Zachary Ramacci of St. John, Ind./ Midwest Training and Ice Center, was first to go for the U.S. men, scoring a 53.435 and performing piked and tucked Triffuses. Then, Logan Gilbert of Paris, Texas/Texas Tumbling and Trampoline, followed with a clean routine and a 55.465. Isaac Rowley of Allen, Texas/Eagle Gymnastics Academy, performed in the anchor position and opened with a three Triffus start before ending with a Miller straight. His 57.080 lifted the U.S. to a 165.980 total and silver. Japan (177.390) was the team champion with Australia taking bronze (162.860).